This antiqued sterling silver owl pendant from Apples of Gold Jewelry is the perfect pendant if you are looking for something charming with an antique feel. The .925 sterling silver pendant is an owl perched upon a tree branch, and the antiqued look that makes up the owl shows some of the outlines of the designs to be a bit darker than the shinier areas, giving the pendant an overall antique feel. In the case of the owl, the areas that make up the shadows on the feathers or the outlines of the owl's eyes are darker. The pendant measures 1 1/6" tall with the hoop/bale and 7/16" wide. 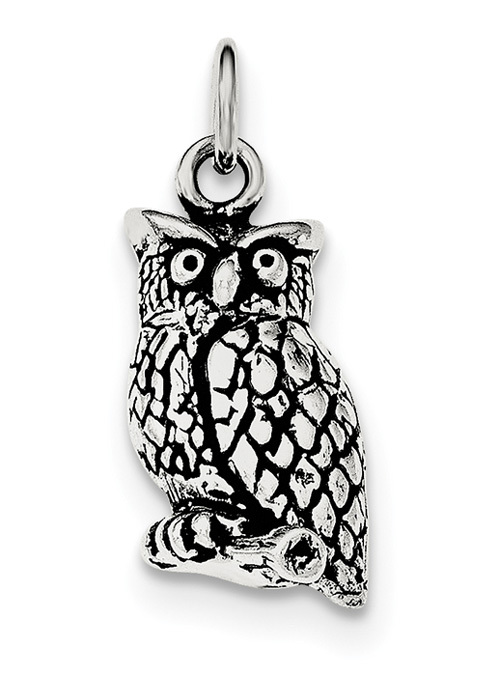 The pendant weighs approximate 2.51 grams and is made in the U.S.A.
We guarantee our Antiqued Sterling Silver Owl Pendant to be high quality, authentic jewelry, as described above.